We provide the shortest domain names you can buy on the Internet. No cheap Unicode IDN hacks but the real, rare, Latin-1 charset ccTLD type domains! Get here some of the most amazing domain assets worldwide. 1 letter / 1 number domains Special: 3.HT! 2 letter / 2 number domains ON SALE! Form 59 USD! Our latest selection for you! Perfect premium domains for your URL shortener services, QR technology platforms and more. TOP LOW RENEWAL PRICES! Perfect for investment. We know less than 50 registries in the world providing a TLD that allows 1-character long domains. And not all of them offer a serious service. 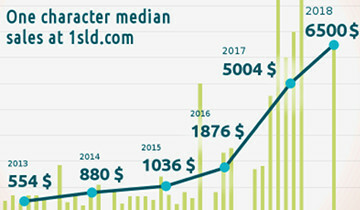 If you invest much money to buy a single-character domain you would like to avoid adventures like thousands percent renewal price increase or weeks of domain disconnected from Internet - things that happened to some exotic TLDs. We understand the needs of companies and institutions and put a spot on security, quality and other factors like human rights. That's why we do not offer all possible TLDs. But still we do offer you the rare domains at good prices - at this site you will find a better domain at cheaper price then on many other services. To make this service possible and extend it in future we directly engage in talks with the biggest registry authorities. What's so special about short domain names? QR marketing - this domains (with exception of IDN ones) allow you to offer shortest possible QR codes to your clients. With only one single-character domain like 1.nf you can generate even more than 100 mln Version 1 (Ver1) QR codes***. This codes can be scanned from wider distances and are a perfect base for marketing purposes. You can print them smaller on print media or get better marketing results because more people can scan outdoor advertisements. The codes also definitly look better than the usual ones. Prestige - be one of 1000 worldwide. Most TLDs do not offer one-character domain names. We recorded only less than 50 domains allowing this - most prominent: .com, .de, .pl, .cz. Because each country can offer technically only 36 such domains (Latin alphabet + digits) there are probably less than 1000 such domains all over the world. The very most of them are sold out or reserved. For two-letter domains each TLD can offer only 1296 domains (Latin+digits, 362). Low costs - low costs for renewal**. You are from China? We can deliver services using 4.cn ! Read also this interesting article with a listing of 1-char domain sales: 单字符域名. ** please note: the renewal prices and conditions depend on third parties - the registrars - and we have no influence to changes of them. The price information comes by best knowledge and intentions but with no warranty at all. You are free to choose your own registrar for holding the domain and can control the prices and other conditions in your own responsibility. **** special bulk offer applies only for domains that are in the special and have the single-price set lower. There can be some domains where a bulk special does not apply or no special applies. Please see the price set for each domain. 5 domains in potential sale process might be no more available. You can still attempt to buy the domain but a success is possible only if the client before you did not finish the transaction properly. If it was not	possible to finish and order the domain for you you will get a refund of your payment. 6 prepaid period can only be used as long the domain remains hosted with MobileSpecialists. When changing the operator (registrant) the free prepaid time depends only on the new operator conditions and might be lost. 7 minimal rent time are 6 months. Renting a domain allows you to use the domain but is not equal with aquireing the ownership. The whois owner records stay by MobileSpecialists. We still can confirm to third parties that you have a preffered first-buy right to aquire the ownership so reselling is possible. Please note: for .us domains (USA) you must have a residence in the USA to buy this domain. For estimations and reports we give information at our best knowledge and our market experience but we do not give warranties that the figures and data provided are correctly. No warranty at all is given with such data and we can not be made responsible in any case the situation might be different. Though we protect the website and data provided we can not give a 100% warranty in case of hacker attacks and manipulations. In any case of offers provided by manipulated data from 3rd parties or in case of manipulations by clients themself or computer programs or any other situation we did not provide an offer in that form ourself, any transactions might be canceled. We will act within the terms of the legal frmework and manage to make steps protecting our company and our clients from illegal activities. All prices are complete end prices without VAT tax as according to § 19 (1) UStG. Impressum & Copyright: © MobileSpecialists.net, opencos.pl, 2010-2018. All rights reserved. We have no influence and take no responsibility for the contents of linked third-party sides. Only 26 domains per country! Each country can offer only 26 real 1-letter short domains in the Latin-1 charset. 1-characters are the worlds shortest possible regular domain length for second level domains. And the very most countries reserved them and do not allow registration. Some allow registration only with restrictions. The number of domains with a business value is very low. That is what makes them extremely rare. Our actual estimations based on our intern report count only 1000 domains in the world with a real long-term business value of 1820 shortest 1-letter domains worldwide at all.